CARMEL, Calif. – Aug. 03, 2016 – Automotive Fine Arts Society (AFAS) member Klaus Wagger will display several new vintage racing paintings at the Pebble Beach Concours d’Elegance® Aug. 21, 2016, from 9:00 a.m. to 4:30 p.m., in Pebble Beach, California. Wagger is known for his ability to capture the drama of auto racing through stunning movement in his art. Sponsored by The Lincoln Motor Company, the 2016 AFAS exhibit at the 18th fairway of Pebble Beach Golf Links in beautiful Pebble Beach, California, will showcase the latest creations from the world’s finest automotive artists. One of Wagger’s featured works is titled “peak performance”. 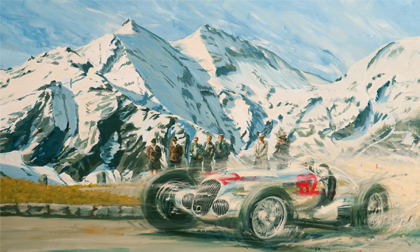 Measuring approximately 55” X 35.5”, this acrylic on canvas, depicts a vivid scene from 1938 of German Ace Herrman Lang on his way up the Grossglockner Hochalpenstrasse, Austria’s highest mountain road. In 1938 and 1939, in an attempt to demonstrate their superiority, Mercedes and Auto Union would routinely showcase their ultimate performance vehicles, the W125 and the C-Type. While both cars were obsolete for Grand Prix racing they were able to consistently blow away the opposition in the European hill climb championship. Another one of Wagger’s paintings that will be on display at Pebble Beach is titled “unstuck”. This acrylic on canvas measuring approximately 32” x 17” depicts a BMW 2002 Alpina cresting a road course at speed. Wagger grew up in the Austrian Tirol. He graduated with a degree in Industrial Design and began freelancing as a technical illustrator. It was at the Retromobile in Paris where his painting career really took off. Automotive art has always been a strong feature of the premier French show and in 2002, Wagger’s style was the talk of the show. Realistic backgrounds don’t interest Wagger, who prefers to put the background colors in quickly to set the mood, and then see the painting develop, surprises included.